Hot milk and honey is my coffee shop beverage of choice – just a simple steamed milk (2% or whole if I’m splurging) with a touch of sweet honey. I realize that as an adult (and a foodie) I should have graduated from hot milk and honey to more sophisticated drinks: lattes, cappuccinos, and whole leaf teas. However, I’ve never found anything as satisfying as the drink my mama made me as a kid – heating up a big pot of milk and stirring in some golden blossom honey . Hot milk and honey temporarily cured my tiny scratchy throat when I wasn’t feeling well, and today, it can untie the knots in my stomach on the days when stress creeps in and attacks. Right now, it’s summer and it’s TOO HOT for hot milk and honey. Enter milk and honey panna cotta. 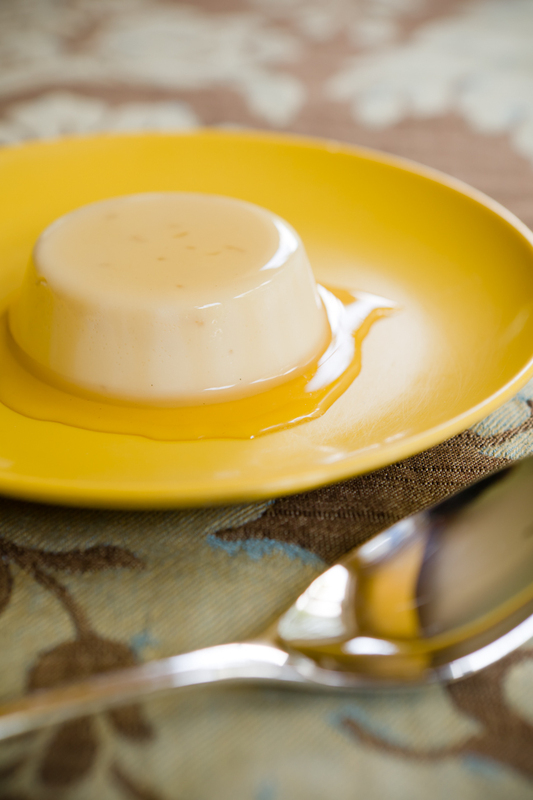 Milk and honey panna cotta has the same flavor as my beloved hot milk and honey, but in a chilled, jello-like format. It would make a perfect palate cleanser in a multi-course meal or an after-work calm-you-down snack. It doesn’t have a massive flavor punch, it’s not super sweet or spicy, it’s just simple and calming, like an edible hug. This milk and honey panna cotta contains agar-agar, a vegetarian gelatin substitute made from red algae. 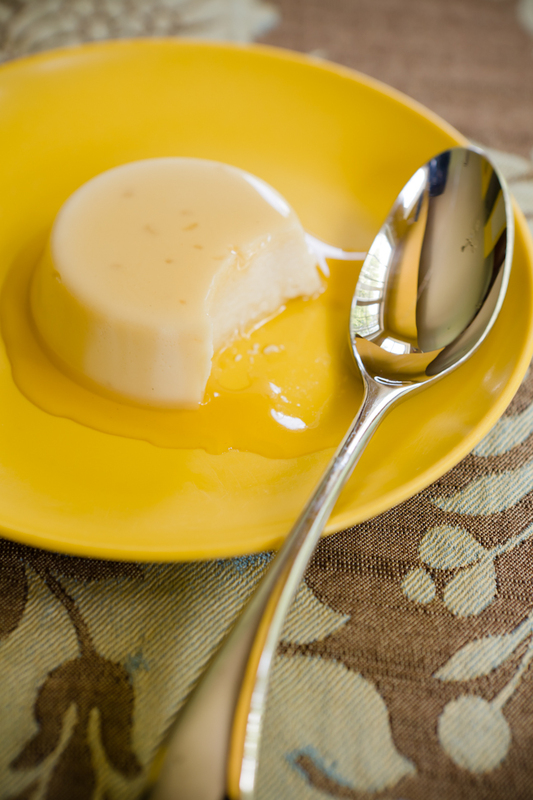 While you can make panna cotta with gelatin, the advantage of agar-agar (other than the fact that it’s vegetarian) is that it is stable at room temperature. This will come into play in my next post when you see how I used this panna cotta to frost sweet pea cupcakes! You can find agar-agar in the Asian section of your grocery (I found it at Whole Foods) or in an Asian market. It is sold as flakes or a powder . I used the flakes, but found that I had trouble with them dissolving in the milk. My only disappointment with this recipe was that I could still see the flakes in the end result (you can see them in the photos; they look like grains of rice). I would recommend either using the powder or grinding the flakes in a spice grinder before using them. Regular panna cotta eaters should also know that this panna cotta is more solid than typical panna cotta. It will easily hold the shape of whatever silicone mold you pour it into. I got the recipe for the honey panna cotta by adjusting a recipe for vanilla panna cotta from from Linden Tea. Hot milk and honey is my coffee shop beverage of choice - just a simple steamed milk (2% or whole if I'm splurging) with a touch of sweet honey. Place all ingredients in a saucepan over medium high heat and stir occasionally until the agar-agar has dissolved completely or almost completely (as noted above, I could never get the flakes to completely dissolve), about 15 minutes. The mixture should remain simmering, but not come to a heavy boil. 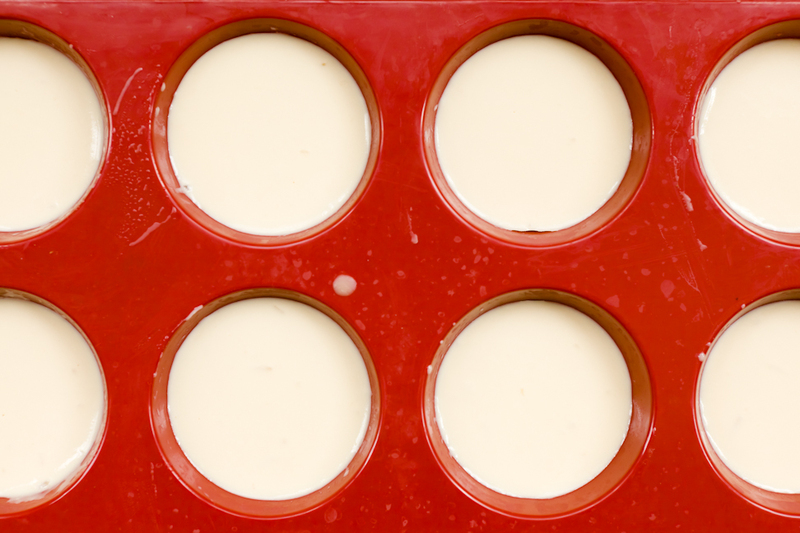 Let the mixture stand for about 10 minutes at room temperature and pour into a silicone mold (any shape you'd like) or ramekins. I made mine in my silicone cupcake tin. I filled the molds 3/4 full and the recipe made eight. Refrigerate until the panna cotta sets, 2-3 hours. Serve cold, drizzled with honey. The panna cotta looks so good. I liked the add of honey on top. I’ve never tried milk and honey together, but it sounds delicious. Love your blog! So happy to have stumbled across it. The desert looks amazing. If it has honey my family will eat it. My husband is a beekeeper and he will use any excuse to throw honey on food. Beautiful! I love that you used agar agar too – I’ve been wanting to try it forever(it’s been in my cupboard for soo long!) Can’t wait to try it in a panna cotta and milk and honey sounds so good. I just found this on Foodgawker and it looks wonderful! I’ve never made panna cotta before and this looks like a very nice recipe to try out as an inaugural run! I was wondering though; can you use regular gelatin in it in the same amount or is there a different ratio? I don’t want to go out and buy agar agar when I have gelatin in my pantry already. Thanks! Humble Food Snob – You should be able to substitute 1 for 1. I haven’t personally tried it, but it should work.